Jeanette Paras' celebrity pumpkins have been in the spotlight for a variety of reasons and are part of pop culture or in the public consciousness. How are the celebrity subjects selected for ‘pumpkinizing’ each year? Simply put, the subjects of Jeanette’s pumpkins have been in the spotlight for a variety of reasons and are part of pop culture or in the public consciousness. How long does it typically take to create a giant celebrity pumpkin? It varies depending on the complexity of the celebrity chosen and the size of the pumpkin (200 lb. pumpkins take less time than a 1,200 lb. pumpkin). Jeanette first draws a sketch before painting and adorning the pumpkin with everything necessary (hair, props, etc.) to accurately depict the chosen celebrities. The whole process can take 50 to 70 hours of time for research, several sketches, painting, set-up, etc. 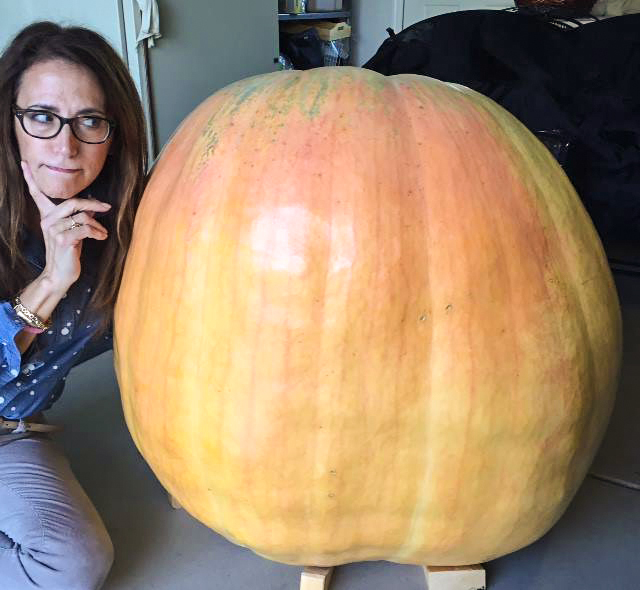 Why does Jeanette create these giant celebrity pumpkins? Bottom line: It’s fun. And the reactions from people (and the media) are priceless. How long do the pumpkins typically last? Depending on the weather, pumpkins can last three months or more. Typically, the pumpkins are not pierced or carved so they last much longer than an average Jack-o-lantern. Where are the pumpkins displayed? Usually, on the front porch of Jeanette’s home in Dublin, Ohio. There have been pumpkins displayed at the Ohio Governor’s Residence as well. What happens to the pumpkin seeds? Jeanette enjoys a great working relationship with pumpkin growers in central Ohio and allows the growers to harvest the seeds from the giant pumpkins to grow another generation of them – before discarding the pumpkins. Who are some of the all-time favorite celebrity pumpkin creations? In recent years, the Trumpkin and Kim Jung Un have garnered so much attention. Before that, Carol (from Where the Wild Things Are), The Hulk, Steve Jobs, Lady Gaga, Miley Cyrus, Betty White, Barack Obama and Hagrid have been some of best and most creative. What about ‘pumpkinized’ political subjects? Everyone in politics – and in public life, for that matter – is fair game. Jeanette’s creations are non-partisan. How can a Paras Pumpkin be used for fundraising? Please contact Jeanette to discuss a unique fundraising opportunity. Arrangements can also be made with growers in other locations to acquire a pumpkin for pumpkinizing.